Patch kit – small square or round patches used to cover and seal a hole in a tube in case you get a second flat on the road; some kits have a tube of adhesive for the patches and other simpler kits have peel and stick patches. Tire boot – a rectangular piece of plastic with rounded corners to place between the tube and a weak spot in the wall of the tire to hopefully prevent the sidewall or bottom of the tire from blowing out, making the tire unusable. This is a temporary fix only to get you home! Inspect your tires for telltale bulges or cracks on the sides as well as the bottoms. You can make a tire boot from a plastic milk carton. You can also substitute a crisp dollar bill or candy or energy bar wrapper in an emergency. Pen – a pen is handy to mark where the tube is leaking if you plan to patch it later. Inspect the tire before you pull out the deflated tube. If you find an offending object in the tire that you suspect caused the flat, mark the tire near the damaged spot on the sidewall so that when you pull the tube out, you can easily see the spot on the tire and you then can mark the tube at the suspected puncture point. This will save time later when you get ready to patch it. This process is pointless if you have a flat in the rain. Fixing a flat may seem like a daunting task, but it really is simple once you know how. If you have ever had a flat and had to walk a good distance home, don’t let the fear of that happening again stop you from riding. Be prepared! I bet you have a friend who can share his or her flat-tire-changing skills with you and would be happy to do so. Take the time to ask and gain the independence that comes with it. It’s worth it! Multitool – handy compact unit specifically designed for bikes that has various sizes of Allen wrenches, chain tool, 8, 9, and 10 mm box wrenches, Phillips and flathead screwdrivers, spoke wrench, knife, and bottle opener, and will fit in a small seat bag. Units containing fewer or even more tools are available. A multitool has the tools you need for simple fixes on the road such as tightening loose parts and adjusting brakes, for example. 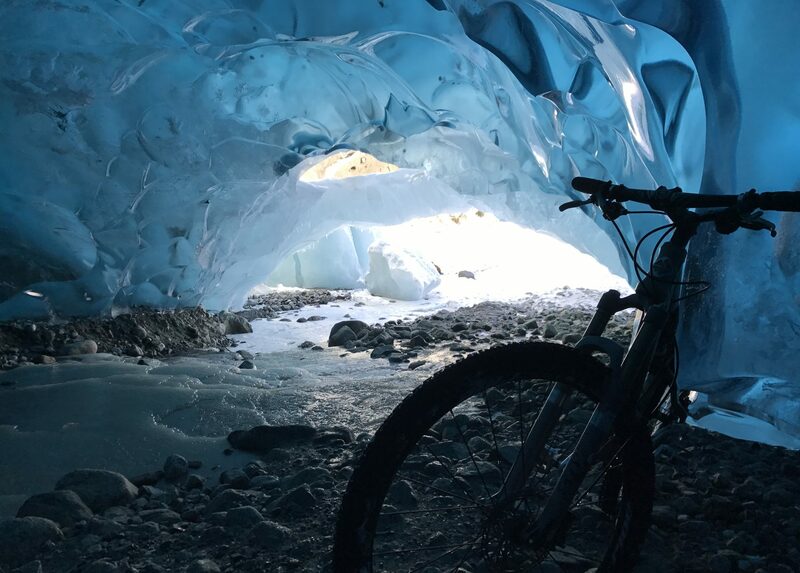 Bike Lock – Bike thieves are busy in Juneau. If you are making some stops around town, protect your investment with a lock. Locks come in all sorts of configurations from huge heavy chains to compact units with retractable cables. Some sort of deterrent is better than none. Don’t make it easy for the thieves! Just in case, take a picture of your bike and write down the specifications: Make and model, color and, most importantly, the serial number which is located on the frame under the bottom bracket. You need to be able to identify your bike if it is taken. Quick Release Skewer – Install quick release skewers with the lever on the non-drive side of the bike. The tapered end of the springs on the skewer should point toward the spokes. Tighten the quick release by turning the nut until it is difficult to close the lever. The proper lever position when closed is flipped all the way closed. Know what your lever should look like when closed: 90⁰ to skewer or further than that. If you can’t close it all the way, loosen the nut and try again. Avoid closing the lever parallel with the fork on the front wheel, or parallel with the seat stays or chain stays on the rear wheel. The parallel position is bad for two reasons: it makes it difficult to grab to open the lever and overlapping parts of the frame or fork may prevent the full closer of the lever. Drivetrain Wear – If your chain is skipping on the cogs of the cassette, the rear derailleur cable tension may need an adjustment or your drivetrain is worn out (or both). Chainrings, chains and cassettes all wear together. If you notice that the teeth on your cassette are starting to look like sharks teeth (pointed and hooked), at a minimum you will need a new chain and cassette. You may not have to replace the chainrings depending upon how they look. If you use one chainring a lot more than another, you can replace just the worn one. If you have replaced the chain, chainrings and cassette, and you are still having problems, your derailleurs may be worn out or misaligned. Change your Chain like the Oil in Your Car: Routinely – If you are a regular rider, put a new chain on your bike every year. Chainrings and cassettes are designed to fit well with new chains. The distance between the rollers of a chain lengthens over time due to wear, causing the gap between the cassette and chainring teeth to lengthen as well, resulting in shifting problems. Most of us don’t think about replacing the chain until we start having problems. Preventive maintenance is a smart plan. Spend money to save money! Regularly replacing the chain will keep the rest of your bike’s drivetrain in better shape for a longer period.